The road to Silver City, Idaho intersects State Hwy 78 about 5 miles east of Murphy, Idaho. 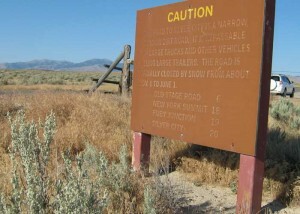 Since it is possible to get out in that country and get stranded, the county has erected this warning sign. No big trucks or big trailers, road is closed by snow from about November 1 to June. First seven miles of the road are paved, then it is packed dirt and pretty steep the rest of the way to Silver City. Silver City is 20 miles from the state highway.